Shall we get started for Detroit? It's Sunday of course but those wicked Americans will keep their theatres open. And we've looked forward to this day for weeks. Hurry along. Get the children aboard the Wyandotte streetcar at the corner of Lincoln Road. Each of us will drop a nickel in the farebox. Three cents for the children. Give them their pennies. Watch for the sheet metal knight on his horse in front of that shop on the north side. That's the sign that we're almost downtown. All off at Goyeau Street. Walk a block west to Dufferin, where Webster Brothers Ford dealership is located. One short block north to the low brick building at the tunnel entrance. (How many of us know that its proper name is the Fleetway Tunnel?). Quite a few Canadians going to Detroit today. Most of them bound for the Michigan or Fox Theatres. Or the Adams or United Artists. Well, why not? To heck with the Depression. Anyway, Prosperity is just around the corner. Didn't Roosevelt say so in his fireside chat just the other day? Board the square-cornered dark grey tunnel bus with its big exterior sun-visor across the entire windshield. Oh, my sainted aunts, how the brick roadbed of the tunnel vibrates the bus. It's like being in one of those new-fangled milk-shake machines in the Jumbo Ice-Cream Parlor on Ottawa Street. Stay together now as we pass through the Aliens' gate at the United States Immigration. As usual, the adults are being asked: "Where do you work?" There aren't enough jobs to go around in these early 1930's and the immigration officers have their hands full trying to stop unemployed Windsorites from looking for work in the States. Board the bus again out on seedy Woodbridge Avenue and ride up to Cadillac Square with its old brownstone Detroit City Hall. Dejected unemployed men competing with the pigeons for a place to sprawl on the imposing stone steps. A few minutes walk on this chilly February day. Boys buttoning leather aviator caps under their chins. Goggles pulled down over their eyes. 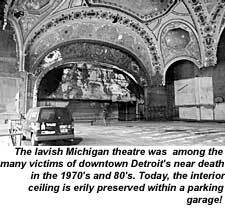 Along State Street, up prestigious Washington Boulevard to Grand River, over a few blocks to Bagley and the magnificent Michigan Theatre, one of the largest movie houses in the entire 48 states. There's a line-up. Get your money ready. That will be a quarter for adults and ten cents for children. It's even more expensive during the week. That's why we come on Sundays. But once inside. Incredible! Look at the rich carpeting, the statues, the painting, the grand piano over there. And look at the seven balconies! Seated at last. There's Jesse Crawford at the organ actually rising out of the floor into the orchestra pit as he plays. Catch your breath as the soft blue spotlights sparkle on the keys. The audience is in great voice for today's sing-song. Our voices swell with the organ to fill this vast theatre with the joyous sounds of "Wait Till the Sun Shines, Nellie". No need to worry about the words. They're all up there on the screen. And the little white ball dances along on top of them to keep us all in step. Now it's the Movietone News ("The Eyes and Ears of the World") and a Betty Boop cartoon ("Boop-boop-a-doop") followed by the feature movie "The Champ", with Wallace Beery and Jackie Cooper. Our eyes ache as we step out into the bright sunshine, reflected on the snow. But they adjust quickly as we walk two short blocks to the White Tower Restaurant at Grand Circus Park. The hamburgers will cost five cents each but they're real doozies. Smothered in thin sliced dills ­ a White Tower specialty ­ they are to us the best hamburgers in the world. Back down Woodward Avenue, the wind at our backs. As we approach the river, expensive shops give way to run-down tobacco stores, novelty shops and cheap cafes with their odours of chop suey. Past the Michigan Book exchange where a fat, unkempt proprietor, cigar stub in mouth, prices second-hand books according to their size. I doubt very much that he can read. Down to the original plant of the James Vernor Company near the river where we complete our day with a five-cent glass of nose-tickling ginger ale. Or, if you could afford it, a cream Vernor's (ginger ale and real cream) for ten cents. Now we board the Windsor-Detroit ferry "LaSalle" for the trip back. Ignore the ice floes. Fifteen minutes later we are at the Ouellette dock, disembarking via the second-deck gangplank. Through Canadian Customs. Downstairs. Emerge behind the decrepit Ritz Hotel on the northwest corner of Ouellette Avenue and Sandwich Street. Home on the Sandwich streetcar with its breathtaking curve at the top of the Peabody Bridge. End of a beautiful day. Total cost for a family of four: less than $3. The bad old days? Well, maybe. But not on Sunday. In Detroit.